Rothbard's great treatise and its complementary text are now combined into a single 4.5"x7" pocket edition. The full 1,500 page treatise in an easy-to-read and super convenient package. It might not seem possible but it is done and it works. It makes a great companion volume to MIses's Human Action in pocket size, as well as the Bastiat Collection in pocket size. Murray N. Rothbard's great treatise provides a sweeping presentation of Austrian economic theory, a reconstruction of many aspects of that theory, a rigorous criticism of alternative schools, and an inspiring look at a science of liberty that concerns nearly everything and should concern everyone. This edition takes this book out of the category of underground classic and raises it up to its proper status as one of the great economic treatises of all time, a book that is essential for anyone seeking a robust economic education. Get it with the Study Guide and you will have what you need. The captivating new introduction by Professor Joseph Salerno that frames up the Rothbardian contribution in a completely new way, and reassesses the place of this book in the history of economic thought. In Salerno's view, Rothbard was not attempting to write a distinctively "Austrian" book but rather a comprehensive treatise on economics that eschewed the Keynesian and positivist corruptions. This is what accounts for its extraordinarily logical structure and depth. That it would later be called Austrian is only due to the long-lasting nature of the corruptions of economics that Rothbard tried to correct. In 1972, this book was selling in hardback for $150 in current dollars. So the pocket edition, which includes Power and Market, a great index, plus improved layout, is about a fraction of the cost of the original, for a far better product. This is a review of the paperback edition and not of the contents of the book. The book is about the size of a mass paperback. It's thick and heavy,it weighs about 1 pound. The text is very readable, it's bigger in size than the paperback edition of Human Action. The paper is thin but not too thin so you can highlight without problems (I would avoid liquid ink highlighters though. Another plus is that the book is less intimidating than the hardback edition. Overall I highly recommend this paperback edition. 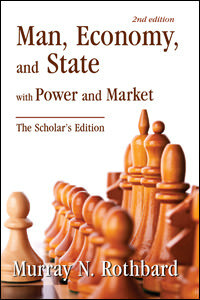 I just received my copy of "Man, Economy, and State" Pocket Edition and love it. I have the full size hardcover edition also, but find myself reaching for this one instead. It is easier to hold and the text, while smaller, is still very readable. It is also, as one would image, much easier to carry around than the hardcover. Like the pocket edition of "Human Action", everything about this book is quality. The Mises Institute once again did a fantastic job!